During the years of 1941 and 1942, the Ateliers Jean Prouvé planned and executed a number of interior design projects for the Solvay chemical company. Numerous pieces of furniture were developed in connection with this commission, including a table made of wood that exemplifies Prouvé's construction methods: its structural details illustrate the interplay of forces and stresses - similar to the late design of the EM Table, whose metal legs distinguish it from its predecessor. Due to the scarcity of metal during World War II, the Solvay table was designed and constructed with wooden legs. 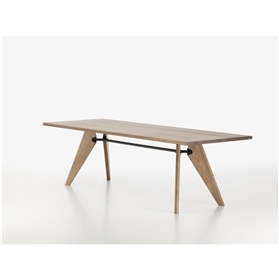 The solid wood components and fine oil finish of the Solvay table give it a sense of ease and refinement, mitigating the technical coolness of its design.